Abuja, Nigeria. November 26th, 2013 - Latest Weekly Poll results released by NOIPolls Limited has revealed that contaminated food and water, as well as poor sanitation have been identified as the main causes of the recent Cholera outbreak in some parts of the country. The poll also found that slightly more than half of those polled (52%) were unaware of the recent cholera outbreak; although awareness was greater in the affected regions. It was suggested that “proper sanitation” (54%) and “provision of safe water” (44%) would help to reduce the further spread of cholera in Nigeria. In addition, on the issue of sanitation and hygiene, the poll found that Nigerians generally have a poor attitude towards sanitation and hygiene (59%); and further suggested that “regular cleaning of the environment and good waste management” (42%) and “personal hygiene” (35%) would enhance general cleanliness in localities. These were the key findings from the Cholera Outbreak Poll conducted in the week of November 18th 2013. The recent outbreak of cholera in some states in Nigeria has led to several casualties. Cholera is an acute diarrhoeal infection caused by ingestion of food or water contaminated with the bacterium Vibrio cholerae which is mostly transmitted through the contamination of water or food with faeces. The disease is a prevalent risk in many countries, with a high rate of occurrence in areas of the world where water supply, sanitation, food safety, and hygiene are inadequate. See NOIPolls Water & Sanitation Poll results for Nigeria. The World Health Organisation (WHO) estimates that there are 3–5 million cholera cases and 100,000–120,000 related deaths worldwide every year. Furthermore, recent reports have shown that between September and October this year, an estimated 2,771 cases and 124 deaths were recorded in Nigeria; while doctors are now monitoring outbreaks in 12 of Nigeria's 36 states. In a joint press briefing with a Non-Governmental Organisation, WaterAid Nigeria, in commemoration of the first United Nations endorsed World Toilet Day this year, the Minister of Health, Prof. Onyebuchi Chukwu stated that “the yearly occurrence of cholera could be stopped if there is a mechanism to stop open defecation which will prevent contamination of water sources and foods that are major causes of cholera in the country.” He also stated that" “Reports from the 14 states affected by the cholera and gastroenteritis outbreak indicated that indiscriminate open defecation practice and lack of toilet facilities, which contaminated water sources and foods, were the major causes of cholera in these states”. Against this background, NOIPolls conducted its latest poll on the outbreak of cholera in Nigeria to measure the level of awareness among Nigerians about the causes and prevention of cholera, the attitude of Nigerians towards hygiene and ways of improving general cleanliness in the society. The poll also served as an avenue to sensitize Nigerians who were unaware of the recent cholera outbreak in the country. Respondents to the poll were asked five specific questions. Firstly, in order to establish the level of awareness regarding the recent Cholera outbreak in some parts of the country, respondents were asked: Are you aware of the recent outbreak of cholera some parts of the country? Responses to this question revealed that slightly more than half of Nigerians (52%) are not aware of the recent outbreak of cholera in some parts of the country. On the other hand, a considerable proportion of Nigerians (48%) are aware of the current outbreak. Gauging the level of awareness from the geo-political zones standpoint revealed that theSouth-West zone (61%) had the highest proportion of respondents that were knowledgeable of the outbreak. This may be explained by the consideration that Lagos state (a South-Western state) was affected by the cholera outbreak and several casualties were recorded. Furthermore, the North-East zone (66%) accounts for the highest proportion of Nigerians that were unaware of the recent outbreak. Secondly, respondents were asked: What do you think is/are responsible for the outbreak of cholera in Nigeria? From the results, majority of Nigerians (60%) affirmed that the outbreak is due to “contamination of food & water”, followed by “poor environmental sanitation” (45%) and “poor personal hygiene” (27%). In addition, 10% of the respondents were unaware of the reasons for the cholera outbreak. An assessment across the geo-political zones showed that while most of the respondents that indicated “contamination of food & water” were from the North-East zone (75%), the South-West zone accounted for the highest proportion of respondents that indicated “poor personal hygiene” as the main reason for cholera outbreak. Thirdly, with the aim of gauging the knowledge of Nigerians on the preventive measures of the further spread of cholera, respondents were asked: In your opinion, what can be done to prevent the further spread of cholera across the country? From the results, a significant proportion of Nigerians had some level of knowledge about the preventive measures for addressing cholera. Majority of respondents (54%) affirmed that “proper environmental sanitation” would prevent the further spread of cholera. This was followed by the “provision of safe water” (44%); the practice of “personal hygiene & food safety” (27%); and “health education & awareness” (21%). 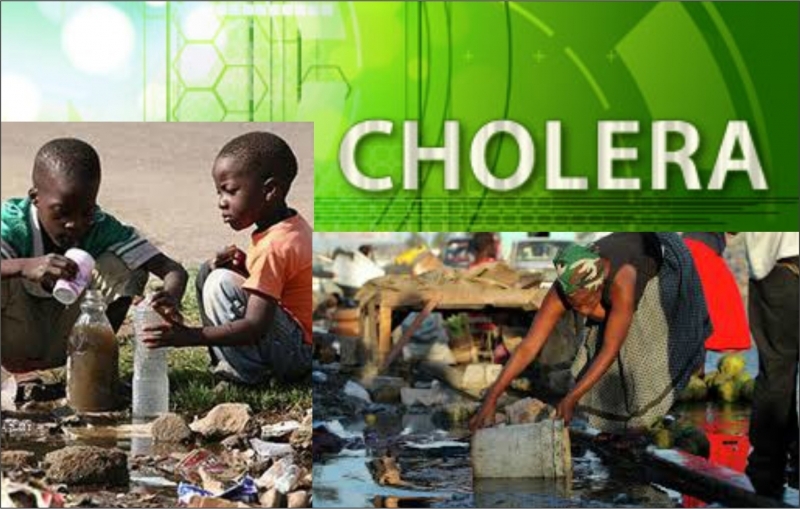 There was a further 8% that were unaware of what could be done to prevent the spread of cholera. Analysis based on geo-political zones revealed that the North-West zone (66%) had the highest proportion of respondents that indicated “proper environmental sanitation” as a preventive measure. Similarly the North-East zone (56%) had the highest proportion of respondents that suggested “provision of safe water”, while the North-West zone (38%) also account for the highest proportion of respondents that claim “personal hygiene & food safety” would prevent the further spread of cholera across the country. Subsequently, in order to assess the general sanitation and hygiene culture of Nigerians, respondents were asked: How would you rate the general attitude of Nigerians towards sanitation & hygiene? Overall, the majority of the respondents (59%: 27%+32%) stated that Nigerians generally have a poor attitude to sanitation & hygiene, with 27% affirming it is very poor and 32% stating that it is poor. Furthermore, 28% were of the opinion that the attitude of Nigerians towards sanitation & hygiene is average; while only 12% (11%+1%) said they have a good attitude. Further analysis across geo-political zones revealed that the North-West zone (75%: 37%+38%) has the highest proportion of Nigerians that are of the opinion that Nigerians have a poor attitude towards sanitation & hygiene, the North-East zone (36%) accounts for the highest proportion of respondents that say it is average; while the South-East zone (20%: 18%+2%) had more Nigerians who believe that Nigerians have a good attitude towards sanitation & hygiene. Finally, in order to further explore the opinions of Nigerians regarding ways to improve sanitation & hygiene in localities, respondents were asked: In your opinion, what measures should be adopted by Nigerians to enhance sanitation & hygiene in your locality? The findings revealed that in order to improve sanitation and hygiene in localities across the country, measures suggested by respondents include: “regular cleaning of the environment and proper waste disposal” (42%); the practice of “personal hygiene” (35%); and the “sensitization of the public and enforcement of environmental laws”. Findings based on geo-political zones show that the North-Central zone (53%) had the highest proportion of respondents who suggested “regular cleaning of the environment and proper waste disposal” as a way to improve sanitation & hygiene. In addition, the North-West zone (32%) accounts for the highest proportion of respondents that suggested the “sensitization of the public and enforcement of environmental laws”. In conclusion, Nigerians have identified “contamination of food & water” (60%); “poor environmental sanitation” (45%) and “poor personal hygiene” as the main causes of the recent cholera outbreak in some parts of the country. Consequently, they have also suggested that preventive measures of cholera to be adopted should include: “proper environmental sanitation” (54%) and the “provision of safe water” (44%). Finally, in order to enhance improved sanitation and hygiene across the country, regular cleaning of the environment and proper waste disposal needs to be enforced. Furthermore, the practice of personal hygiene in homes and public places need to be encouraged; while there’s need for more public sensitization on the importance and benefits of proper sanitation to the society and family, particularly the children. There’s also the need for enforcement of the existing laws in order to ensure the public is protected from all forms of environmental hazards that may have negative impact on the health and wellbeing of citizens.